Today’s cookie is perfect with coffee, and you can skip the cream because the cookie has the creamer it it! These oatmeal cookies have a dash of Coffee Mate Belgian Chocolate Toffee flavored coffee creamer (the powdered type) for added flavor. You can, of course, vary the flavors, but I had some toffee bars in the pantry and matching them with toffee flavored creamer seemed like a good idea at the time. I was very happy with these cookies and loved how the powdered creamer added a subtle note of toffee flavor. In fact, I liked it so much I’m going to try a second batch with one of their new flavors (Caramel Macchiato, Café Latte, and White Chocolate Caramel Latte) and switch up the add-ins. For instance, white chocolate chunks with the new White Chocolate Caramel Latte. I’ll let you know how it goes. 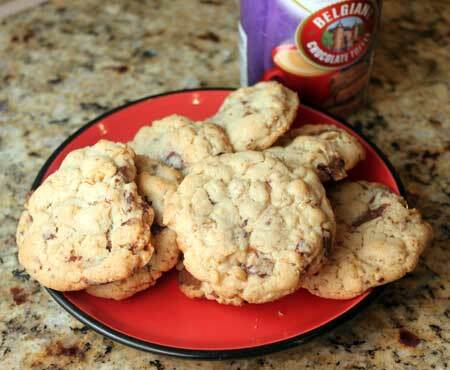 An easy oatmeal cookie with a little extra flavor from toffee flavored creamer. Preheat oven to 375°F. Have ready two parchment lined baking sheets. Mix the flour, baking powder, baking soda and salt together in a bowl and set aside. In the bowl of a stand mixer fitted with a paddle attachment or in a large mixing bowl using a hand-held electric mixer, beat the butter until creamy. Beat in the Coffee Mate, brown sugar and granulated sugar and continue beating for another 2-3 minutes or until very light. Reduce mixer speed and beat in the egg. When egg is mixed, beat in the vanilla. Add half of the flour mixture and stir until incorporated. Add remaining flour mixture, followed by the oats and toffee. Using a tablespoon, scoop up balls of dough and arrange on a parchment lined baking sheet spacing about 2 ½ inches apart. Bake for 10 to 12 minutes or till edges are golden. Transfer to a wire rack and cool completely before serving. Loved this recipe- substituted little caramel balls and caramel machiatto creamer…delicious! thank you for sharing! I love toffee! Why I have never made cookies with toffee, I will never know! Changing it up! Heath bars are my favorite candy, so I welcome this recipe. Can’t wait to try it. It sounds delicious. Thank you for sharing! I wonder if the folks at Hershey think one of their products is inferior to the other since they make both Heath and Skor? MMM yummy! Love chunks of toffee in cookies. Yum, they look amazing! I love toffee in cookies, and I love cookies with coffee – obviously this is the perfect recipe for me. Thanks for sharing! Toffee must be on the brain. Yesterday I made the Chocolate Fudge Brownie with Toffee and Dried Cherries from Regan Daley’s “In the Sweet Kitchen”. Skor bars seem to have disappeared from our stores and I had to use Heath Bars, which I consider inferior. I found a recipe for homemade Daim Bars. I’ll have to make them when I get a chance to see how they compare to Daim Bars, which are the best. Interesting timing with this recipe. This past week I talked myself out of purchasing a bag of Heath Bars. I really wanted those little toffee bars!! I love when there’s an interesting ingredient in cookies and they turn out well! All those creamer flavors do sound good in a cookie. I like how thick they look. Seems when I’ve made cookies with toffee, they usually come out thin.